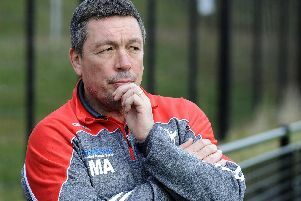 Sheffield Eagles director of rugby Mark Aston has confirmed he ‘fears the worst’ for French centre Nabil Djalout who limped out of the recent victory over Rochdale. The Eagles chief has confirmed that it looks as though the French international has damaged his Achilles tendon, which could see the close season signing out for a considerable amount of time. The latest injury blow arrives following the news that Cory Aston will be sidelined for up to two months with a knee problem, leaving Aston’s already threadbare squad further down on numbers. “We have lost Nabil, it didn’t look good at the time so now someone else needs to stand up,” Aston confirmed. “It looks like he has ruptured his Achilles tendon. We fear the worst. “He is having the scans, he has had a pot put on to ensure it is stable. They may have to operate, if that’s the case it will happen soon. We will know quickly, we fear the worst. The former Catalans ace moved to centre for the victory over the Hornets, and impressed with a number of promising carries before being forced out of the action with 15 minutes remaining. Djalout was missing from Monday’s defeat to Batley, and Aston admitted he was ‘gutted’ by the news after confirming his belief that he found a suitable long-term place for the 29-year-old. “I am gutted because I think we have found his position now here at this club,” Aston added. The latest setback against Batley still leaves the Eagles one point and one place above Sunday’s opponents Swinton, in what looks to be a crucial early season showdown. The Lions picked up their first point of the campaign after a draw against Barrow on Monday.